Spirit Tracks Artwork: 14 New Pieces! I have added 14 new fan artwork pieces to our Spirit Tracks Enemy Gallery. The image you see to your right is one of my favorite submissions that we have gotten thus far. 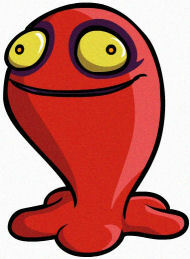 It is a well drawn Red ChuChu from Spirit Tracks. If I didn’t tell you it was fan artwork, you might guess it is actually official Nintendo artwork since it’s just that brilliant. You can view a larger image of it below, along with several other featured images for this month. Another personal favorite of mine is the Keymaster created by defno as it is really well done. Remember, you can post a comment about each piece of artwork on its individual gallery page. With these new artwork pieces now available, we have gone ahead and updated our Enemy Artwork Projects Page. This brings are total number of artwork images to 107! We still have a ways to go, but we now have six enemies which I view as being complete, along with a handful of enemies that are almost there. If you’d like to help us out in this ongoing project, just check out the page, find an enemy you’d like, and draw it up however you imagine it. Regardless of your talent ability, I’ll post it up in our gallery!